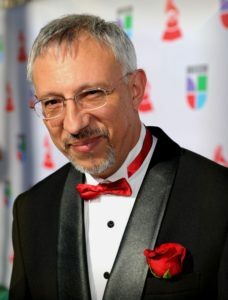 Three-time Grammy nominated American composer Miguel del Aguila was born 1957 in Montevideo, Uruguay. In more than 115 works that couple drama and driving rhythm with nostalgic nods to his South American roots, he has established himself among the most distinctive and highly regarded composers of his generation. Also a pianist, del Aguila understands music from the performer’s perspective, which has earned him a devoted following among soloists and ensembles. His music has been performed worldwide by nearly 100 orchestras and by hundreds of ensembles and soloists throughout the Americas and Europe, and is recorded on 34 CDs. You can listen to Del Aguila’s music on his YouTube channel. Del Aguila has a decidedly international background, and his music has an international appeal. Del Aguila’s first two Grammy nominations were for the entire chamber music CD “Salón Buenos Aires” (Bridge Records) and the piano quintet Clocks on that CD. The third was for his Concierto en Tango, a 2015 cello concerto that has received over 25 performances since its premiere by the Buffalo Philharmonic.